A creative take on Mexican food! 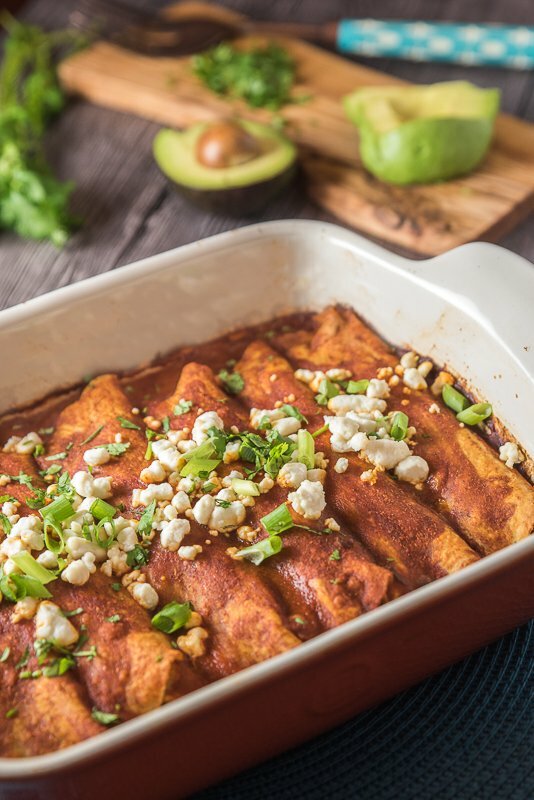 These veggie enchiladas are stuffed with black beans, corn, and creamy goat cheese, then smothered with a homemade enchilada sauce. I adore Mexican food. So I decided to try my hand at homemade enchiladas this weekend. But, of course, plain old cheese filled enchiladas were not going to cut it. I had my heart set on something a little more creative. 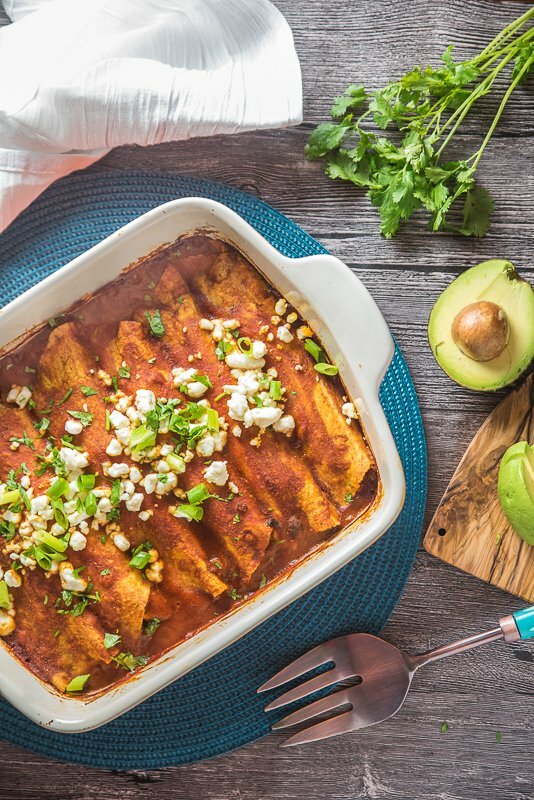 These Veggie Enchiladas are packed with flavor from black beans, corn, goat cheese, and a slightly spicy homemade enchilada sauce. Perfect for your next fiesta! 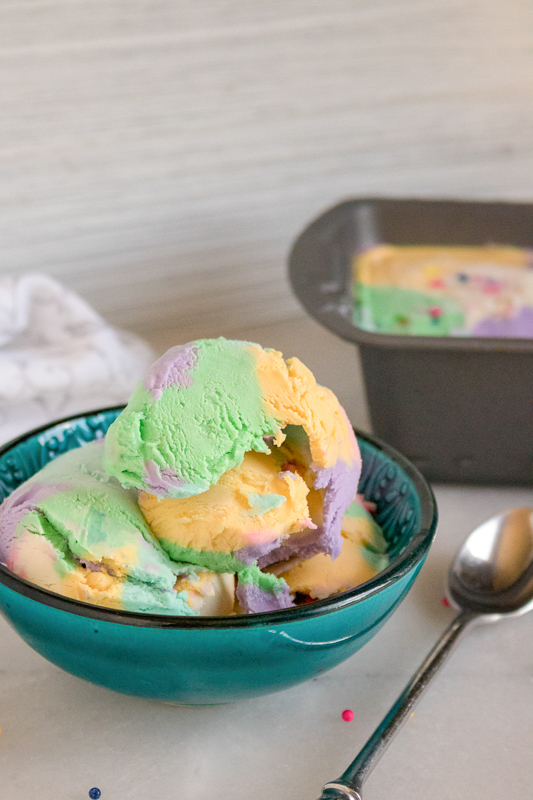 I especially love how versatile this recipe is! 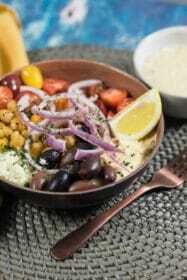 You can swap the black beans for any variety you like – kidney beans or cannellini beans would be great for this dish. 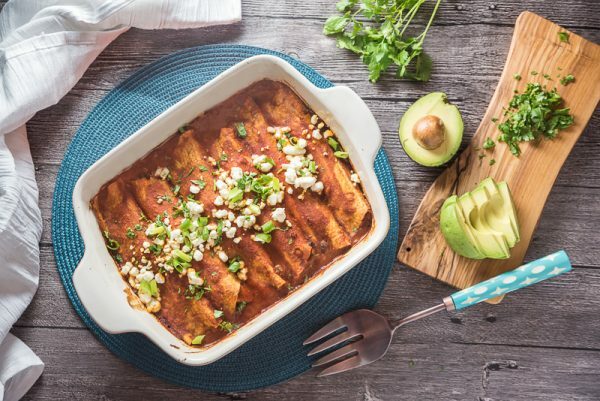 For my non-vegetarian readers, you can easily add meat to these enchiladas. Although it’s quite filling as-is! 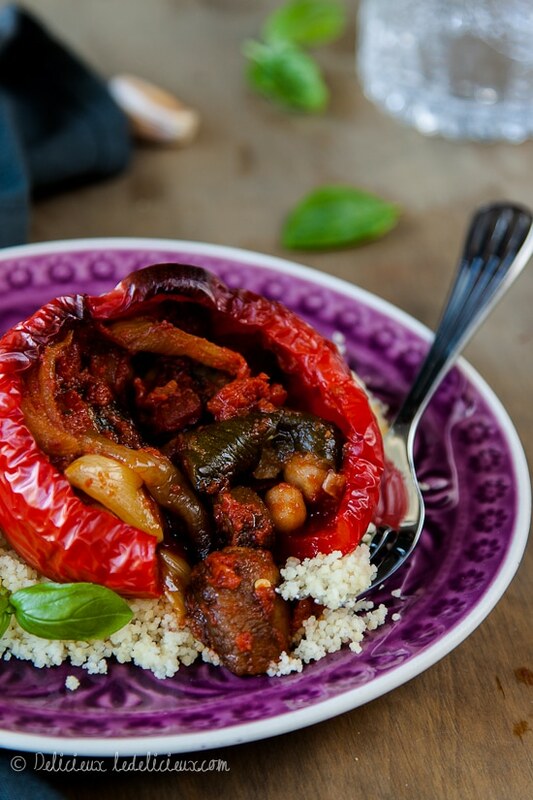 And of course, you can use any combination of veggies that you have on hand. 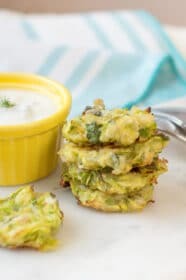 I bet this would be delicious with roasted zucchini or sweet potato. 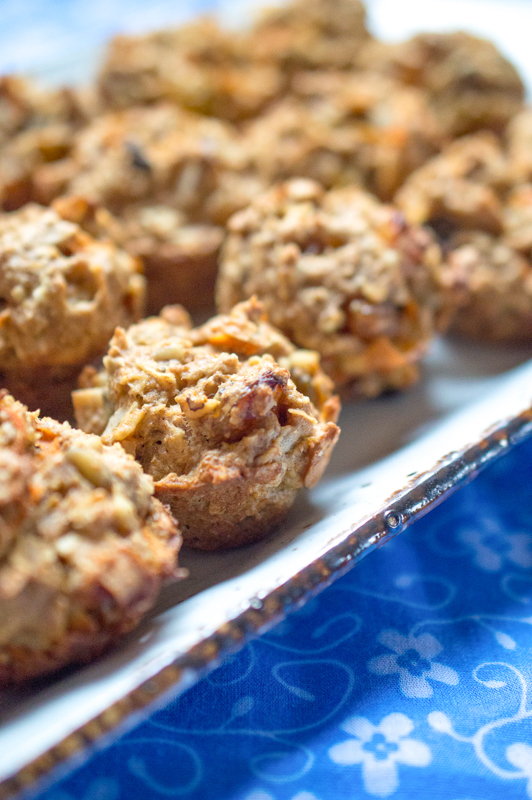 As I have several friends with gluten intolerance, I am always on the lookout for recipes that I can easily make gluten-free without sacrificing taste or quality. So I was very excited when Mission Foods asked me to try out their new gluten-free tortillas. 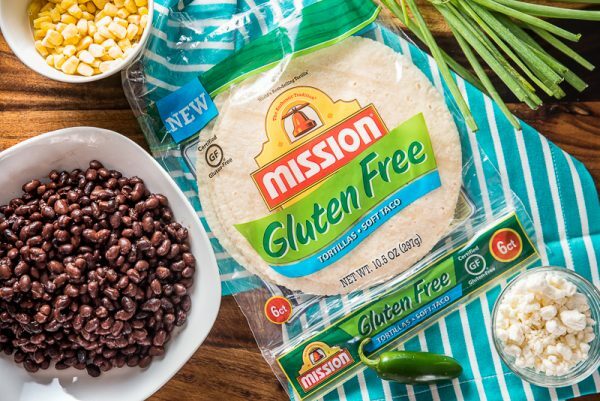 Mission Gluten Free Tortillas are wheat-free, certified gluten free, and Kosher. They worked perfectly for my Veggie Enchiladas, and they taste every bit as delicious as regular tortillas. If I hadn’t cooked this meal myself, I would never have known that it was gluten-free. 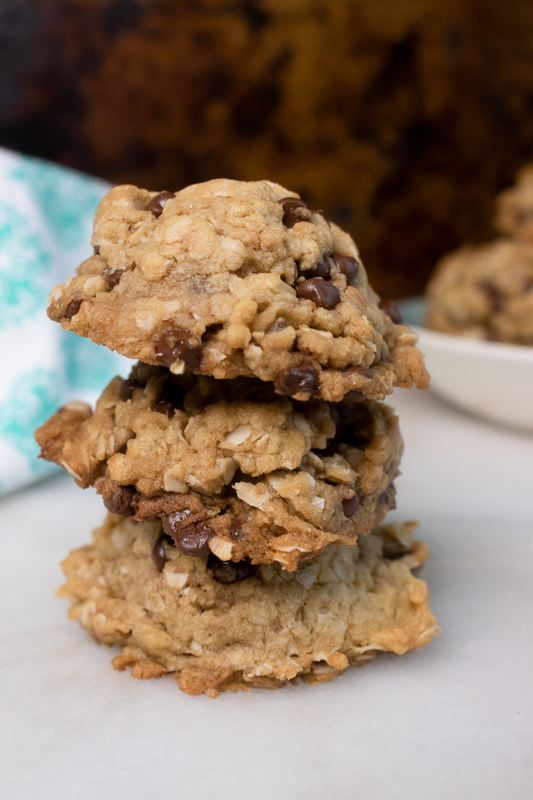 I can’t wait to try these in more recipes! 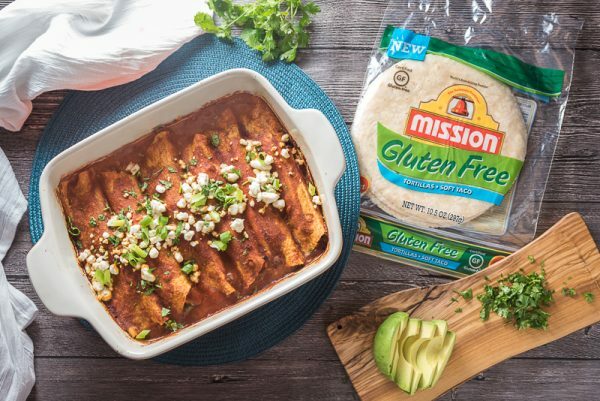 If you have gluten-free friends or family members, check out the glutenfreemission.com website – it’s packed with some truly delicious gluten-free recipes, some great tips for gluten-free living, and a store locator so you can find Mission Gluten Free Tortillas at a store near you. To get started, let’s cook up our homemade enchilada sauce. I kept it pretty simple here – my sauce is made from a combination of tomato sauce, garlic, jalapenos, and some of my favorite Mexican spices. Of course, if you want to make this recipe even faster, you can always use a store-bought enchilada sauce. I won’t tell! Next, we move on to the filling for our veggie enchiladas. Start off sautéing the onions, jalapeno, and garlic until they are soft and golden. Your kitchen will smell amazing – and if you’re anything like me, your mouth will be watering by this point. Then, just stir in the black beans, corn, and goat cheese until you have a deliciously creamy filling. Then comes the artistic part – assembling the Veggie Enchiladas! Simply spread some of the filling down the center of each tortilla. Roll them carefully, and line them up in a big baking dish. Cover everything in a light layer of enchilada sauce. I was a little worried about the mess factor of this part, but I am pleased to say that these Mission Gluten Free Tortillas were incredibly easy to work with. They were soft and pliable, just like regular tortillas, and held up really well to being handled. I even let my two-year-old get in on the enchilada rolling, and my kitchen emerged unscathed. A few minutes before the enchiladas were finished baking, I added some crumbled goat cheese on top, so it could get that perfect melty, toasted finish. And then I served the Veggie Enchiladas topped with cilantro and scallions. Yum! I made a huge batch, thinking we would save some for lunches this week. But no such luck – we ate every last one. If you want to give these Mission Gluten Free Tortillas a try yourself, check out their store locator to find them. 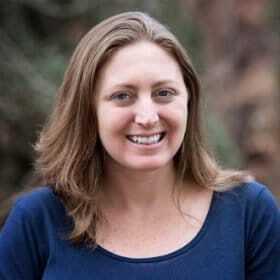 I know they would be perfect in all kinds of recipes – wraps, quesadillas, tacos, and more. In fact, I bet they would be perfect for making a gluten-free version of my Mexican Street Corn and Sweet Potato Tacos. The tortillas have the best flavor when they are served warm. So just heat them in a dry skillet for about 10 second per side, or place them between two damp paper towels and microwave for 30 seconds. Then you can use them in place of the corn tortillas in that recipe! Heat a drizzle of olive oil over medium heat. Add half of the garlic, and half of the jalapeno. Cook for 3 minutes, until soft and golden. Add the tomato sauce, oregano, basil, chili powder, cumin, salt, and pepper. Stir sauce and bring to simmer. Cook for 10 minutes to combine flavors, stirring occasionally. Set aside. Heat olive oil in a large, non-stick pan over medium heat. Add onion, remaining garlic, and remaining jalapeno. Cook 4-5 minutes, until softened and slightly golden. Add black beans and corn, and cook for 3-4 more minutes. Add goat cheese and stir until well combined. Spread a thin layer of enchilada sauce in the bottom of a large baking dish. On a cutting board, lay out the tortillas. Spread goat cheese-veggie filling down the center of each tortilla. Roll tortilla up around the filling, and line them up tightly in the baking dish. Sprinkle with remaining goat cheese, and bake for additional 5 minutes. 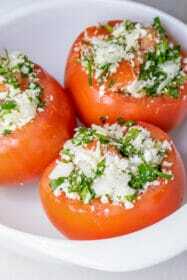 Serve topped with cilantro and scallions. Serve avocadoes on the side, if desired. These look amazing! I wanna try these tonight! I love the idea of using goat cheese! 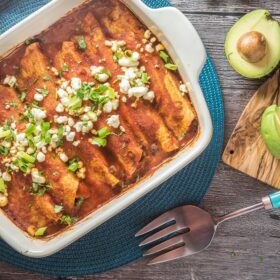 My husband loves enchiladas, so I will probably try this soon!! OH MY YUM!!! These look incredible! 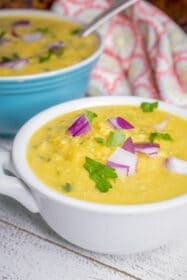 I’m happy to find a veg/GF recipe that looks delicious!! I may have to try this for a meatless Monday meal! It looks so good! Homemade enchilada sauce sounds like fun! I’ve always bought it! Sounds tasty!